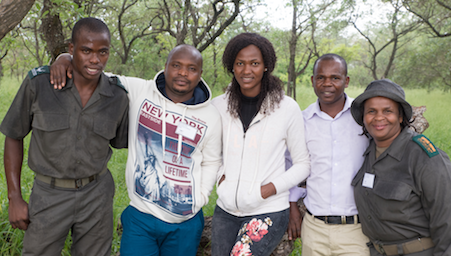 Funding for training in nature conservation is limited in southern Africa. With this in mind the Trust strives to increase its annual funding disbursement to the College. Our annual strategic planning session was held in February with fundraising plans agreed on for the year by the Trust’s Chairperson together with its Fundraiser and the Executive Manager of Fundraising and Marketing for the College. With the support of our valued and loyal donors, as well as expert management and tenacious work, the Trust increased its disbursement to the College from R850,000 in FY2016 to R1.2 million in FY2018. We are also now pleased to share that with your support the Trust has been able to increase its support to the College to R1.3 million in the current financial year! The items funded are guided by the needs of the College and include scholarships and bursaries to top deserving students to attend the year-long accredited Higher Education and Training natural Resource Management certificate courses, as well as much needed support towards marketing and fundraising. From L to R: Joshua Matsane (South Africa), George Phiri (Zambia), Selma Njahi Sikopo (Namibia), Noble Munbi (Zambia) and Tandiwe Buyeye (South Africa), SAWCT’s 2018 scholarship and bursary recipients. In addition, in support of the College as a leader in the conservation training sector, the Trust is delighted to fund the development of the new Foundational Learning Certificate (FLC), a two to three month numeracy and literacy programme, which will be offered by the College to meet the requirements being put in place in 2019 by the Department of Higher Education and the Quality Council for Trade and Occupations (QTCO). This will broaden the scope of courses available at the College and will be compulsory for all students going on to tertiary education, as well as being a prerequisite for some of the courses at the College. Their support will help in training conservationists from across southern Africa to deal with the challenges being faced in conservation today, whilst also motivating us to passionately continue working to support education and skills development at the Southern African Wildlife College. Finally, please look-out for our upcoming fundraising campaign in June to celebrate World Environment Day. Our work at the Trust to nurture and strengthen conservation leadership for today and tomorrow, helps to ensure that future generations will have the opportunity to still enjoy southern Africa’s exceptional natural heritage including its wildlife. A living legacy our passionate supporters believe is well worth investing in!